Hydro technology uses running water to generate electricity, whether it’s a small stream or a larger river. All streams and rivers flow downhill. Before the water flows down the hill, it has potential energy because of its height. Hydro power systems convert this potential energy into kinetic energy in a turbine, which drives a generator to produce electricity. 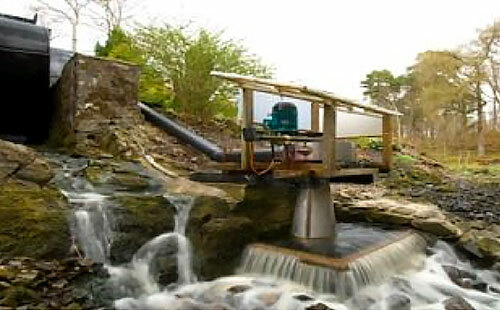 The greater the height and the more water there is flowing through the turbine, the more electricity can be generated. The amount of electricity a system actually generates also depends on how efficiently it converts the power of the moving water into electrical power. Small or micro hydroelectricity systems, also called hydropower systems or just hydro systems, can produce enough electricity for lighting and electrical appliances in an average home. A hydro system can generate 24 hours a day, often generating all the electricity you need and more. If eligible, you’ll get payments from the Feed-in Tariff for all the electricity you generate, as well as for any surplus electricity you sell back to the grid. A hydro system may generate more electricity than you need for lighting your home and powering your electrical appliances – so you can use the excess to heat your home and your hot water too.